"A great starter for any dinner that's quick and easy. 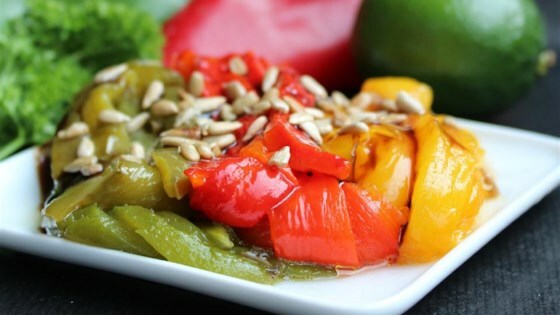 Rosemary adds an aromatic flavor to the bell peppers, and the sunflower seeds add to the texture of the dish." Preheat the oven broiler. Line a baking sheet with aluminum foil. In a skillet over medium heat, cook the sunflower seeds 5 minutes, stirring constantly, until lightly toasted. Place the pepper halves cut side down on the baking sheet. In a bowl, mix the olive oil, lime juice, balsamic vinegar, rosemary, salt, and pepper. Brush peppers with the olive oil mixture. Roast peppers under the broiler 5 minutes, or until slightly charred. Remove from heat, peel, and slice. Toss with the toasted sunflower seeds to serve. This was quite good. I skipped the sunflower seeds- as I merely wanted the bell peppers on their own. I also added a little more balsamic vinegar for a tangier taste. Very different and very good. I'm usually not a fan of sunflower seeds, but done this way, they were delicious!